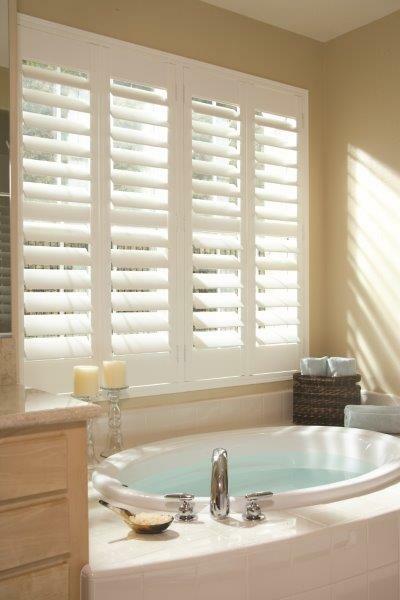 Whether it is the only room you are looking to dress, or the last in the whole house, shutters are a great window dressing for your bathroom. 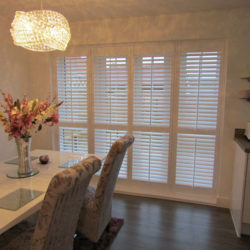 Plantation shutters offer a stylish, practical and hard wearing window covering where other products cannot cope with the humid and moist atmosphere. They provide added privacy and are easy to keep clean whilst adding ambiance and great light control. Any fabric product can suffer from mildew, whilst thin wood venetian blinds can warp easily from the humidity. 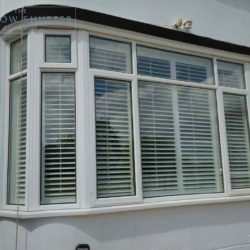 No other window treatment can complement feature shaped windows either as shutters are custom made to fit triangular and curved windows of any shape or size. 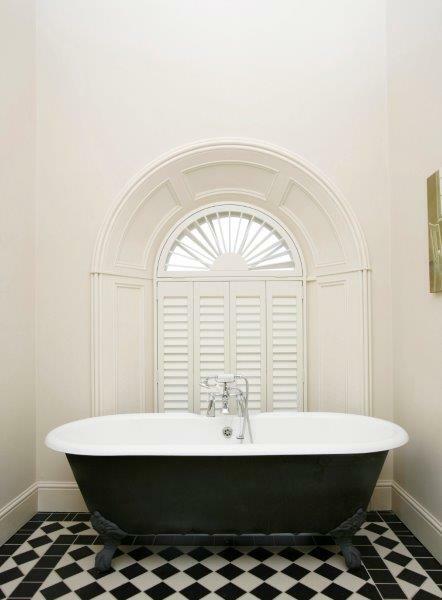 Our Hollywood range is the ideal product for bathroom shutters. Made from ABS plastic (Acrylonitrile Butadiene Styrene) this product is guaranteed against water damage. 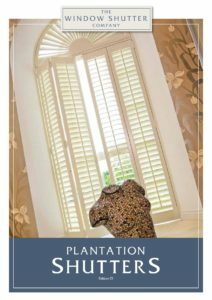 Used for many purposes, ABS's lightweight, toughness and ability to be injection moulded and extruded make it a perfect material to produce plantation shutters. It is also used in products such as drain-waste-vent pipe systems, musical instruments, golf club heads, automotive trims, medical devices, electrical assemblies, protective head gear, white water canoes and toys such as Lego bricks. The key benefit of this product range is its toughness and the fact it is waterproof. 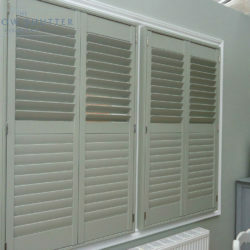 Essentially a plastic product, this range stands out from all other plastic shutters on the market as it looks fantastic and is difficult to tell apart from top end wood ranges. The finish is clean and smooth and is an excellent product to work with. Available in 6 shades of white, the Hollywood has all the louver and tilt options of the other ranges but retains its guarantee in the humid and harsh environments. 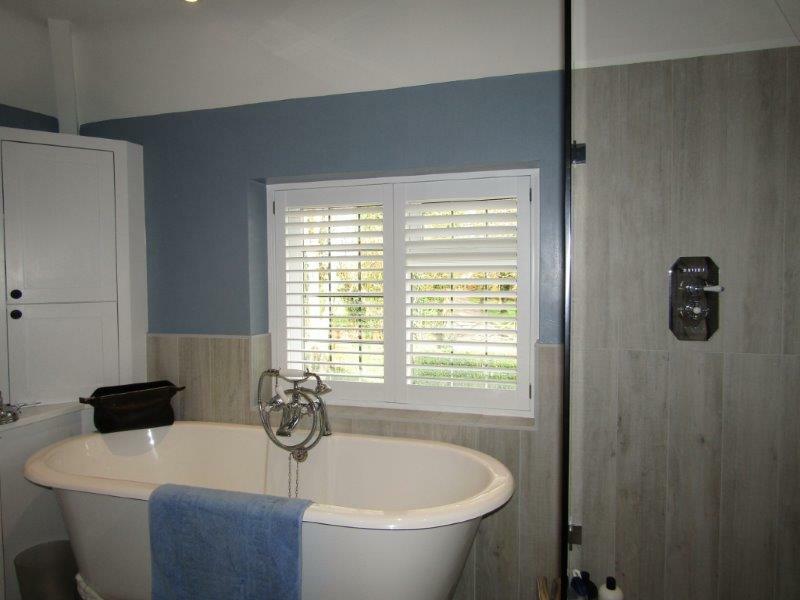 Whilst Hollywood is the ideal bathroom shutter, we can, in the right situation, offer any of our other ranges should you wish to match the rest of the house or require a coloured option. If your bathroom is well ventilated and the shutter is not directly over a bath, shower or sink then there should be no problem at all. 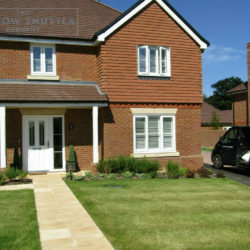 We can guide you through the decision during our design visit and advise the best range for you. Contact us today to book your FREE site survey or to discuss the benefits of window shutters and options that will best suit your requirements.